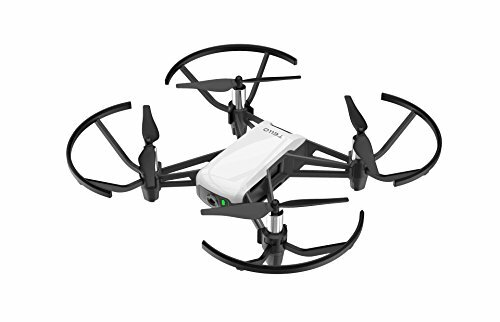 New to Drones No Problem: Flying Tello couldn’t be easier! Just pull out your phone to fly anytime or anywhere with intuitive controls. See the World from the Sky: Whether you’re at a park, in the office, or hanging out at home, you can always take off and experience the world from exciting new perspectives. Tello has two antennas that make video transmission extra stable and a high-capacity battery that offers impressively long flights times. Fantastic Features for Endless Enjoyment: Thanks to all the tech that Tello’s packing, like a flight controller powered by DJI, you can perform awesome and complex tricks and with just a tap on screen.5 Flying has never been so fun and easy! Capture Great Pictures and Videos: Equipped with a high-quality image processor, Tello shoots incredible photos and videos. Even if you don’t know how to fly, you can record pro-level videos with EZ Shots and share them on social media from your smartphone. Relax! Tello’s Super Safe: Tello's lightweight, yet durable design combined with software and hardware protections make it so you can always fly with confidence. Learn & Create: Play is an essential part of learning, so we made Tello programmable with Scratch, an MIT-developed coding system allows kids and teens to learn the basics of programming while having fun. If you’re a more advanced user, you can also develop software applications for Tello using the Tello SDK. If you have any questions about this product by Tello, contact us by completing and submitting the form below. If you are looking for a specif part number, please include it with your message.